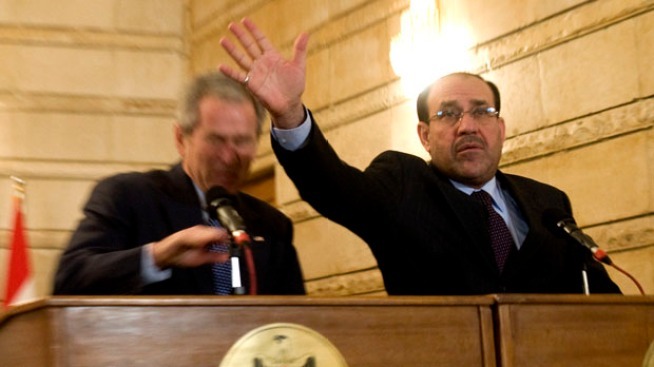 Iraq's Prime Minister Nuri al-Maliki tries to block US President George W. Bush after an Iraqi man threw his shoes at Bush during a joint press conference and signing ceremony at Maliki's private office during an unannounced visit to Baghdad, Iraq, on December 14, 2008. 1. Because before the shoe was even thrown by Iraqi reporter Muntadar al-Zaidi, George Bush went in for a straight-on fraternity-style handshake with Iraqi Prime Minister Nuri Kamal al-Maliki. 2. Because shoe-throwing (along with calling someone a dog, which al-Zaidi also did) is one of the most offensive insults an Iraqi Arab can hurl. After the fall of Baghdad, the United States government made much ado about those seemingly trumped-up videos of children throwing shoes at the fallen statue of Saddam Hussein. It's not awesome to see our president attacked, but it does neatly complete the circle, doesn't it? 3. Because al-Maliki totally tried to deflect the second shoe. 4. But he didn't try that hard. 5. Because George Bush was kind of laughing throughout the whole thing. 6. Because the other Iraqi reporters immediately jumped in to stop the shoe attacks. 7. But the Secret Service took their sweet, sweet time to take the guy down. 8. And let's be honest, the reporters around al-Zaidi who reacted the quickest were mostly just taking pictures. 9. Because nothing politically funny ever happens over the weekend now that the election is over (we're looking at you, Saturday Night Live). 10. Because whatever you think of George Bush, he ducked those shoes like a frigging Japanese game-show contestant. No other world leader could have dealt with that situation with the same humor and quick reflexes. We're legitimately impressed.